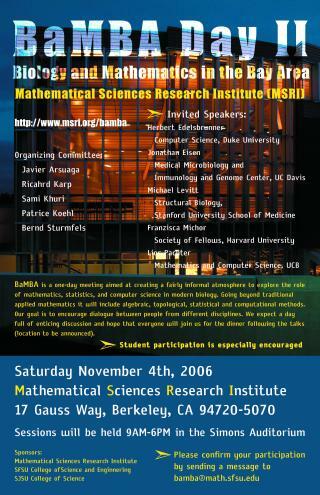 BaMBA is a one-day meeting aimed at creating a fairly informal atmosphere to explore the role of mathematics, statistics, and computer science in modern biology. Going beyond traditional applied mathematics it will include algebraic, topological, statistical and computational methods. Our goal is to encourage dialogue between people from different disciplines. We expect aday full of enticing discussion and hope that everyone will join us for the dinner following the talks (location to be announced). Student participation is especially encouraged. We explore models and methods suitable for studying the structure and dynamics of very large protein complexes that we term "nanomachines". We using a novel approach to molecular morphing to study the large conformational changes associated with the power stroke of the muscle motor, myosin. We compare the normal modes of the myosin head piece at different levels of atomic detail. The models vary by an order of magnitude in the number of interaction centers and two orders of magnitude in the number of degrees of freedom. These same methods are applied to a variety of other large complexes that play central roles in the molecular biology of the cell. The work presented in this talk is motivated by microarray experiments aimed at illuminating gene regulation in embryonic somite development. This development is approximately periodic, generating one somite at a time. The microarray experiment yields a one-dimensional function representing expression per gene. We measure the extent to which a function follows the same periodic pattern and is a candidate in participating in the process. To this end we simplify functions, integrate numbers of critical points, and prove the stability of the resulting measure. We evaluate the resulting rankings based on genes for which there is biological evidence of their direct involvement in somite development. Work in collaboration with Mary-Lee Dequeant, Yuriy Mileyko, and Olivier Pourquie. I will discuss research in my group on the genomic basis for the origin of novelty in microorganisms. Most of our work has involved genome sequencing and I will discuss how a phylogenomic approach, in which evolutionary reconstructions are integrated with the genome sequence analysis, can greatly improve our ability to understand how novelty originates. I will give examples involving gene family diversification, lateral gene transfer, extremophiles, and symbionts. In addition I will discuss how the new field of metagenomics, in which one sequences DNA isolated directly from the environment, can also benefit greatly from an evolutionary perspective. Throughout I will discuss how evolutionary approaches differ fundamentally from other bioinformatics methods that do not specifically try to incorporate the path of history into analyses. Evolutionary concepts such as mutation and selection can best be described when formulated as mathematical equations. Cancer arises as a consequence of somatic evolution. Therefore, a mathematical approach can be used to understand the process of cancer initiation, progression and treatment. I will discuss a mathematical analysis of chronic myeloid leukemia during therapy with the chemotherapeutic agent Gleevec. We take a few initial steps towards a description of the human genotope. This object is the convex hull of all allele frequency vectors obtained from the genotypes present in the human population. Its construction will facilitate population based genetics studies, such as association mapping studies. We use data from the HapMap Project, restricted to two ENCODE regions, to study a subpolytope of the human genotope. We compute and examine three classes of low-dimensional projections of this polytope. The projections are specified by principal component analysis, restriction to tag SNPs, and by archetypal analysis. This is joint work with Peter Huggins and Bernd Sturmfels.